The Runners Village presented by Hilton St. Louis at the Ballpark opens at 9:00 am on Saturday, March 14, 2020, in Kiener Plaza. 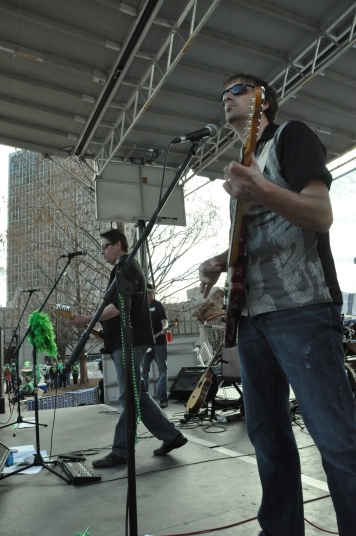 The Irish-themed entertainment area will feature food, beverages, merchandise and live entertainment. It will be open before, during, and after the parade. Starting at 9 AM until …..
* Some of the songs Pedestrians play you may not immediately realize as among your favorites. You will reevaluate your list of such upon hearing them that day. The 2020 Leprechaun Village opens at 9:00 a.m., in east end of Aloe Plaza. The Irish-themed entertainment area is for children of all ages. The Hilton St. Louis at the Ballpark hotel is the official hotel of the St. Patrick’s Day Parade and Run. For information on special St. Patrick’s Day Parade and Run room packages, visit the Hilton’s Hotel Specials page.